We currently are selling some of the same tools we use in our shop, in our Online Store. Here we will talk a little bit about them. If you work on Meyer Snow Plows, and Meyer snow plow pumps, then these are a "MUST HAVE". This is the only tool currently on the market that allows you to operate each valve on the pump unit independently. 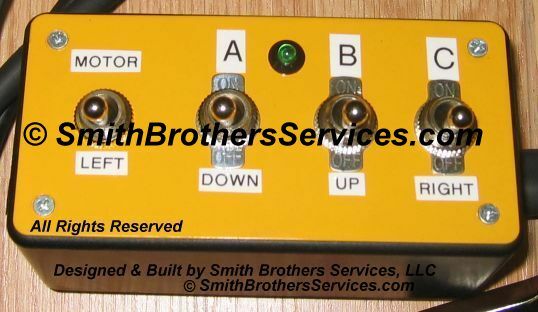 Other tools on the market are just a box with standard Meyer Angle, and Raise/Lower toggle switches. They work the same as toggle switches mounted in the cab. Our Diagnostic Tool allows you to energize each coil independently, without the motor coming on, so you can hear the valves opening, listening for a distinct "click". It also allows you to energize a single coil, and check it for magnetism, per the Meyer Troubleshooting Guide, which is part of the Service Manual for each model.. (Click here to download all the manuals from the Meyer website for FREE.) The long harnesses accommodate batteries on either side of the vehicle, and allow you to stand clear of the blade while testing for proper operation of all functions, and allowing you to see exactly what is happening when you operate the plow. It eliminates the need for an assistant to work the controls in the cab, and it eliminates the need for you to stand dangerously close to the plow blade to troubleshoot. We take great pride in building these units. WE INVENTED THEM in 2007. We reserve all rights pertaining to them. We will take legal action to protect our invention! All wires are 16 gauge like Meyer original wiring harnesses. All switches are rated at 20 amps. All harnesses are covered in Dual Wall Adhesive Lined shrink tubing. All battery clips are rated at 50 amps. We TRIPLE layer the wire harness covering where it leaves the box to ensure a long service life with no chafed wires. All units are tested in our shop before they are shipped to ensure proper operation. 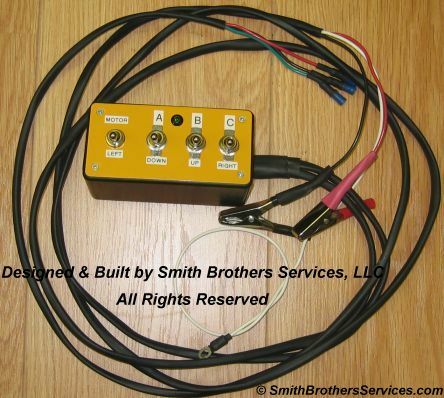 We use this same controller on our plow pump test stand in our shop. Look for an adapter harness to use this tool with E-58 pumps (with 3 valves and two wires to each coil) in the near future in our eBay store. This is a pressure gauge that can be used to check and adjust pump discharge pressure. There is no other way to check it, or adjust it if necessary without a gauge. 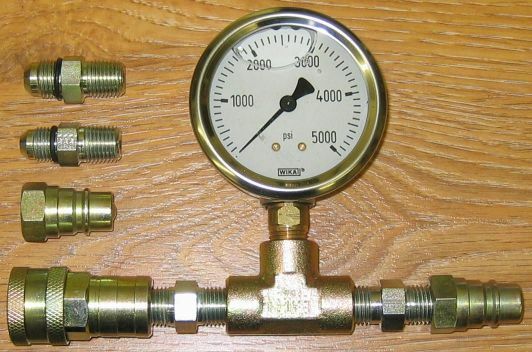 As far as pressure gauges go, it is the standard to use a gauge that reads one and a half times the working pressure of the unit or system being tested. A 5,000psi gauge is perfect. It allows you to adjust the pump pressure, with room to spare on the dial, and it also allows you to set the Crossover Relief Valve pressure on Meyer plows which is 3800psi. It is imperative that the Crossover Relief Valve be working properly! If it does not, you can blow hoses, or even split a hydraulic angle cylinder in half! We have had plows come into our shop with aftermarket angle hoses on them that are rated at 2500psi working pressure, and 4,000psi burst pressure! That sure is cutting it close! A better choice is a hose with a 4,000psi (or higher) working pressure, and a burst rating around 7,000psi. We have never seen one like this on the market. It allows you to hold the Carbon Brushes in place while installing the top cap on an E-46, or an E-47 motor. Once the tool is holding the brushes, you can install the cap and the screws, then slip the tool out, and tighten the screws. Much easier than another tool we have seen on the market that takes two hands to use, and MUCH easier than the "2 putty knives" or the "two hacksaw blades" methods we have heard about. The tool is made from heavy gauge aluminum. We hope to offer these again some day, the last time we made them was 2008! Very simple. 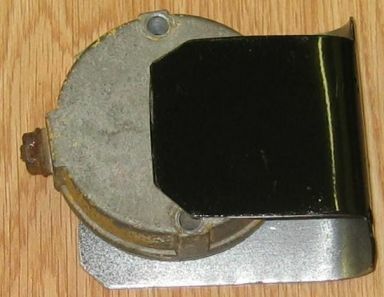 This tool aids in the removal of the Crossover Relief Valve from the Power Angle Block. It is made out of stainless steel for durability and rigidity, as well as a long service life. Check back frequently as we are always coming up with better ways to perform common tasks, and make our job and yours easier! This tool is used to hold the Pump Check Valve in place when installing the E-60 Pump back into the E-60 Housing. 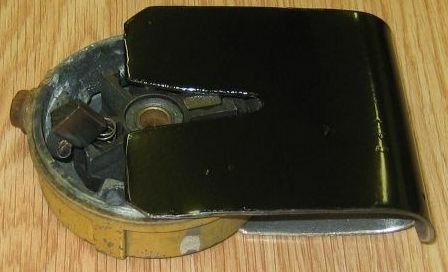 Meyer Plow Pistol Grip and Touchpad Test Box (Diagnostic Tool). I made the first one on 10-3-2007. I have been using it in the shop since then. I never made any for sale, until now. I made one for sale. I have parts on hand to make 6 more of these. These are BUILT TO ORDER. 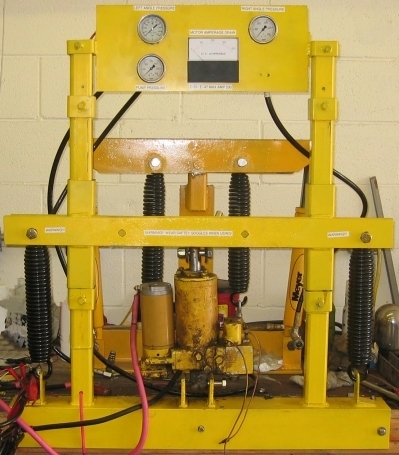 This is the test stand we use to test pumps before and after rebuilding them. We designed this tool ourselves. There are many out there, but we built this one to suit our needs. It accepts all Meyer Snow Plow Pumps, and some others as well.